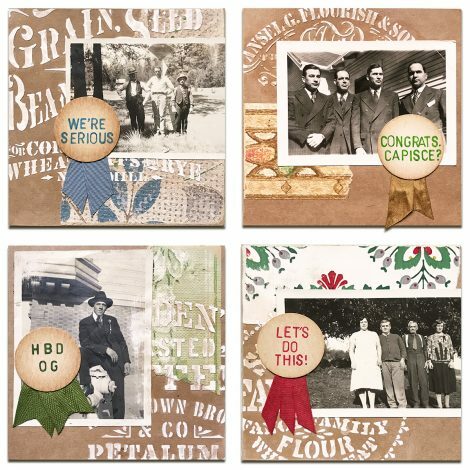 Inspired Barn 6-inch stencils are just the right size for adding unique layers to cardmaking projects. Though paint, glitter, and inks work well for mixed media papercrafts, I really like using modeling/texture paste to create slight dimension. After adhering the wallpaper scrap I stenciled with modeling paste and let dry. I brushed over the stencil area with moistened Distress Crayon pigment. Once that dried, I lightly sanded with my MicroZip sander. Using the plastic alphabet stencils and Sharpie pens to color-coordinated to the wallpaper and ribbon, I stenciled simple messages on the milk bottle caps, and attached ribbon to the back. 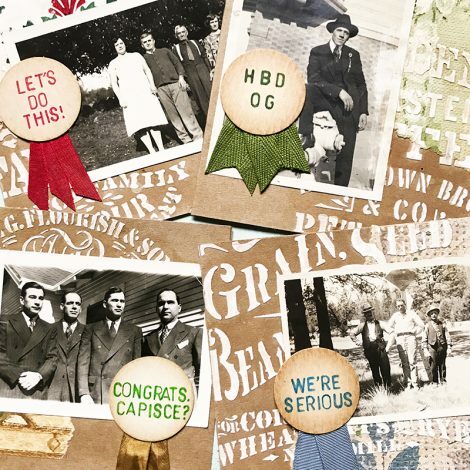 I attached vintage photos from my stash and the bottle caps medals to each card as the final layers. 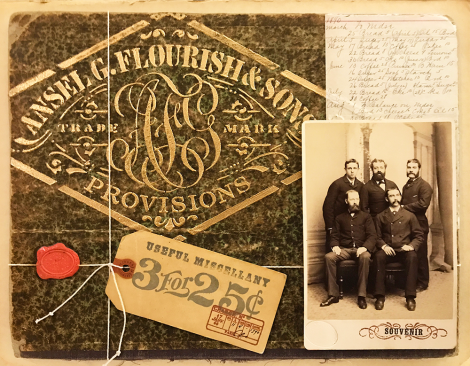 I placed each card into the pages a large book, adding more more weight on top, to flatten overnight as the moist modeling paste and moistened Distress Crayon pigment caused slight warping of the kraft card stock. 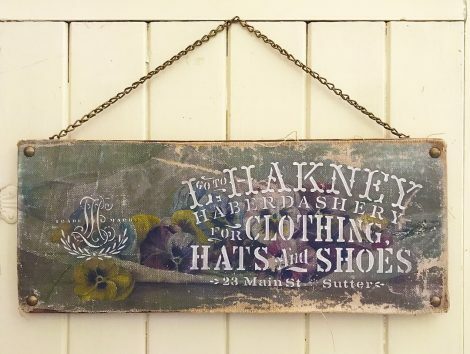 Since the launch of my exciting new line of Inspired Barn Stencils a few weeks ago I’ve been having a blast customizing stuff around the studio, including inexpensive finds from thrift stores and flea markets. 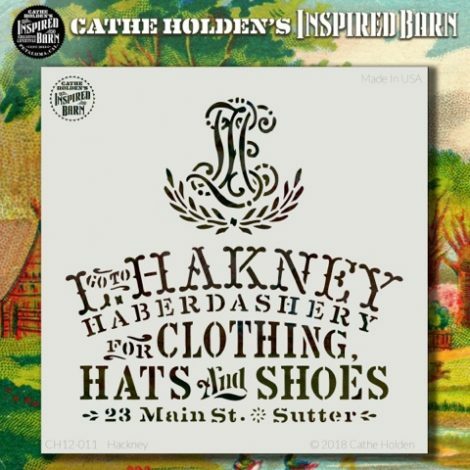 There are currently 24 typographic designs in two sizes, (some with additional decorative designs included), all available at iStencils.com and in Petaluma at The Find, with more stockists coming soon! Below are some of the projects I’ve done that each took less than an hour, some only minutes. 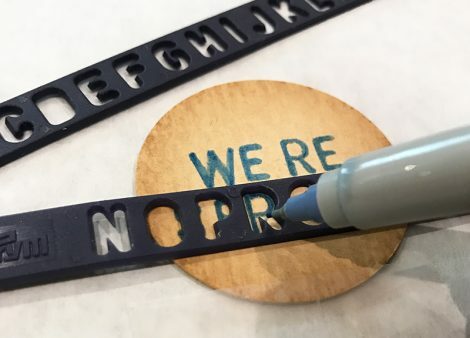 IMPORTANT: For the best success using stencils, I can’t stress enough how vital it is to use a repositionable (non-permanant) spray adhesive on the back of your stencil, allowing to slightly dry to a good tackiness vs. wetness, and pressing firmly onto your surface to stencil. This seals up the holes and keeps paint, ink and other liquids from seeping under the stencil causing feathered edges. 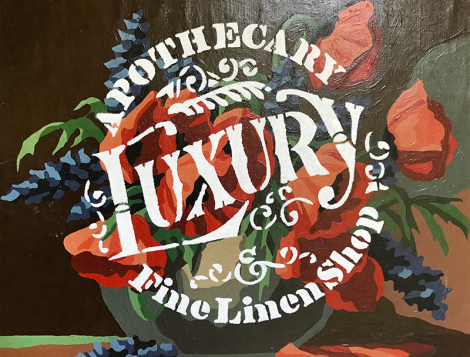 And it’s good practice, when using a very runny liquid, to dab excess from the stencil brush and lightly pounce rather than swirl or brush the substance. 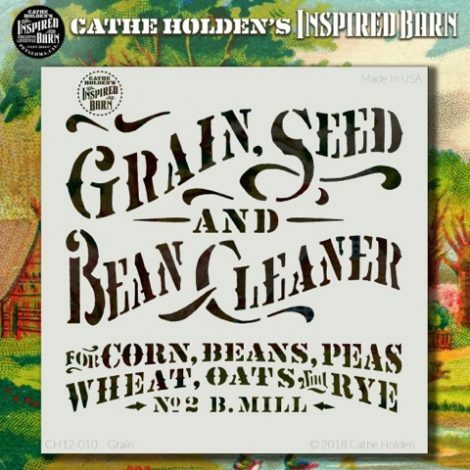 Allow to dry and reapply, in multiple applications if needed. 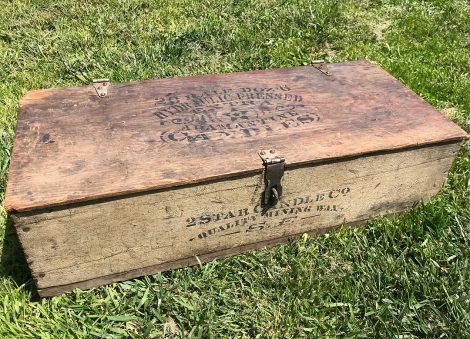 This old box was purchased for $8 at the local flea market. 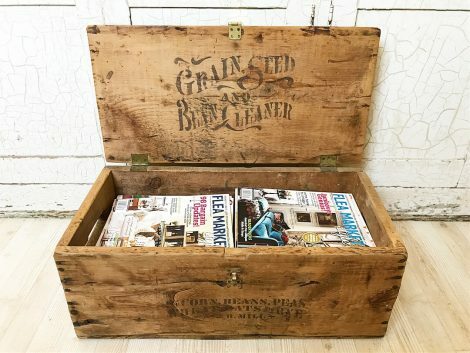 Using basic acrylic craft paint and CH-IB GRAIN stencil it was transformed into super cool magazine storage. 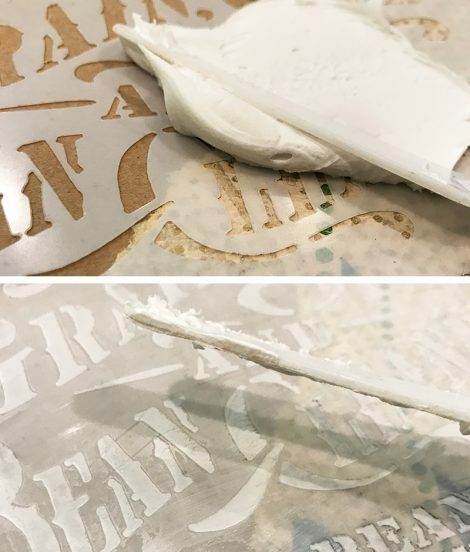 Before removing the stencil, I lightly rubbed the painted area with a paper towel to fade some of the paint, leaving the outer edges of the lettering darker. I like how it turned out. I remember spying this beat-up old painting attached to a board at the flea a few years ago and only paying $3. It sat around in the studio just waiting to be transformed. 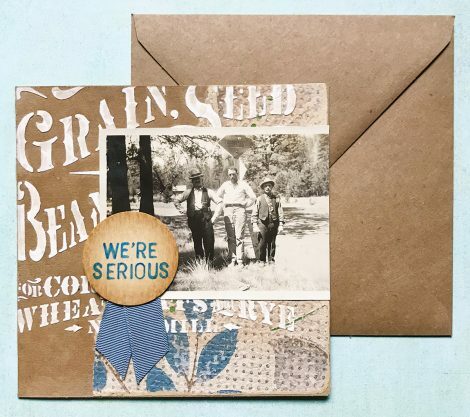 I used white texture paste to add dimension with the CH-IB HAKNEY stencil and aged the dried paste with one of my favorite supplies, a brown Tim Holtz distress crayon, moistened with a brush, painted around the lettering, and lightly sanding the raised areas. 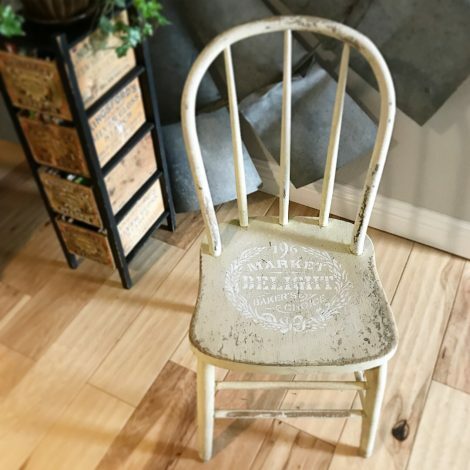 This design divided up also worked great on this $12 find from a local antique store- a folding metal and wood chair just begging to be stenciled. I used gold and brown acrylic paint. 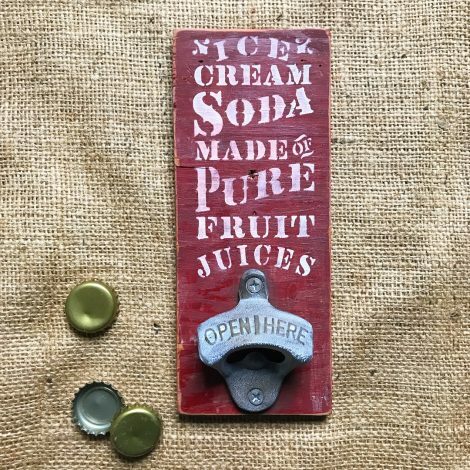 I used the 6″ version of the CH-IB ICE CREAM stencil to create a bottle opener from a scrap piece of painted wood. My first time experimenting with white Tulip Fabric Spray Paint was a total success. 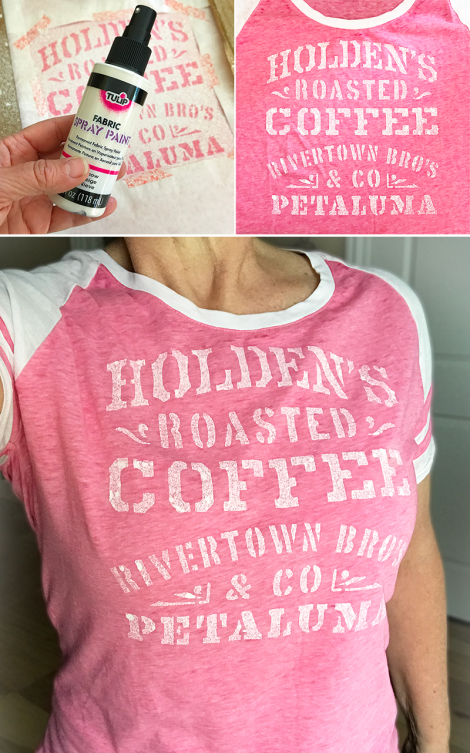 I love the aged effect of the spray with the CH-IB COFFEE stencil on this $10 T-shirt. 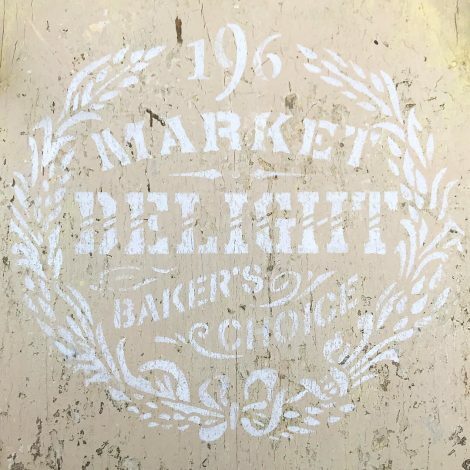 The mini version of this stencil with acrylic craft paint worked great broken up to use on a little wooden letter holder I’d been kicking around the studio. 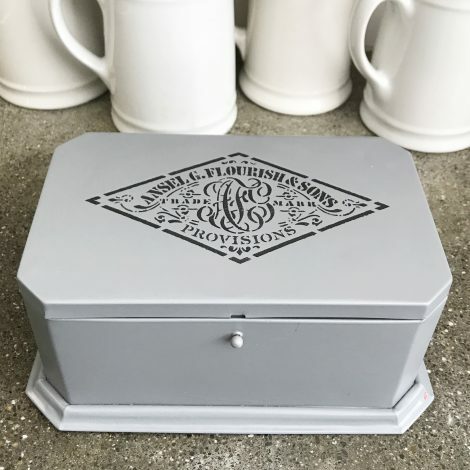 Another grungy, old box was turned into what looks to be a fabulous antique with the CH-IB CANDLES stencil and acrylic craft paint. I’m finding stenciling to be so pleasant to do outdoors on sunny days. 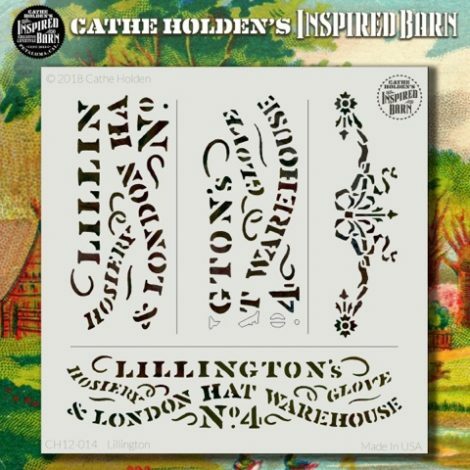 The CH-IB LILLINGTON stencil comes in multiple sizes, one smaller and one larger that can easily be pieced together when painting. 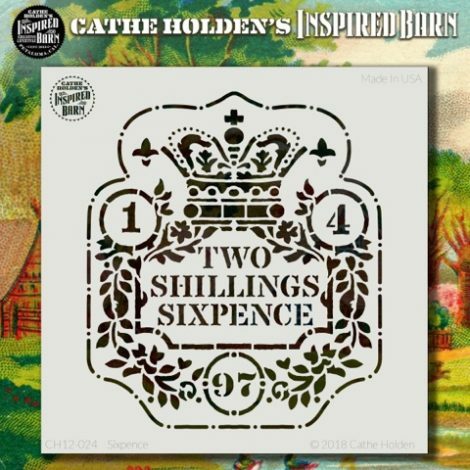 The large stencil yields two sizes, the small stencil one size plus an extra graphic. 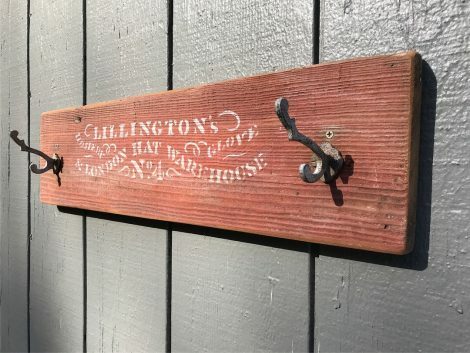 I whipped up an awesome coat rack with a piece of old-growth redwood in original faded red paint by stenciling and adding vintage-style hooks. 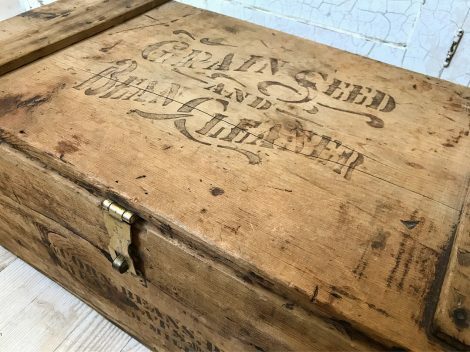 The same stencil was also used with gold acrylic craft paint on this storage dresser in my studio. 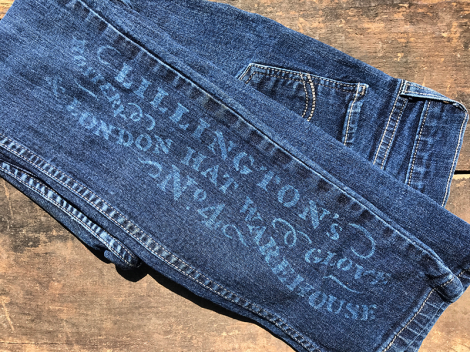 I also used the stencil with bleach to rock these jeans. 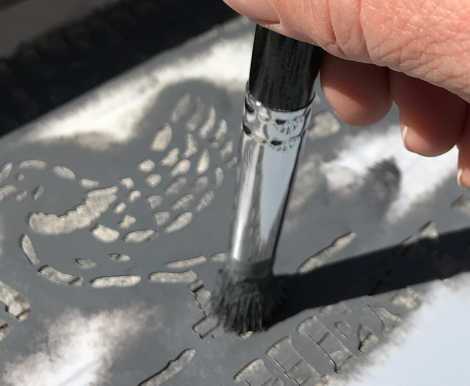 I filled a little spray mist bottle with bleach, sprayed a light coat over the stenciled area, dabbing dry the puddled up areas atop the stencil and allowed to dry, repeating this step multiple times until reaching the effect I wanted. Next I’ll be trying a bleach pen, I’ll let you know how that goes. 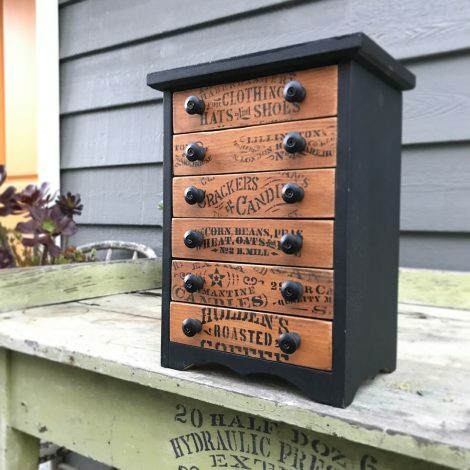 The 6″ mini versions are so perfect for mixed media projects but I couldn’t wait to use them on this little 6-drawer cabinet I use in my bathroom to hold nuggets like my contact lenses, hair bands, and such. 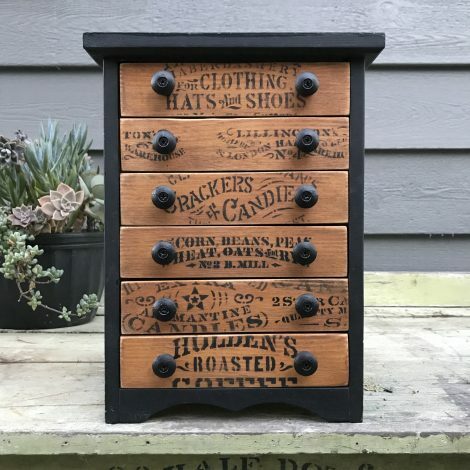 Previously painted all black, I removed the knobs, sanded the drawer fronts, stenciled them to look like boards pulled from mini wood crates, replaced the knobs and WOW! 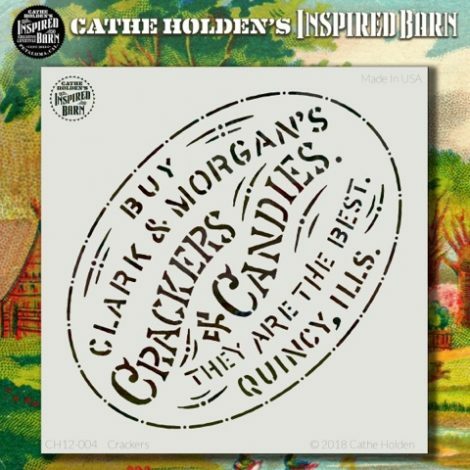 Used were the CH-IB LILLINGTON, HAKNEY, CRACKERS, COFFEE, CANDLES and GRAIN 6-inch stencils. I think the CH-IB CRACKERS stencil is my favorite design so far. 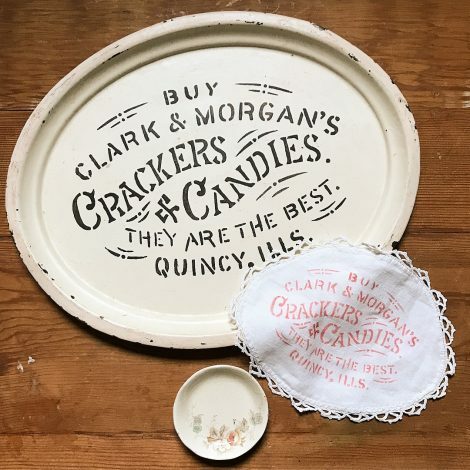 I used the larger one to give major cool-factor to an old tin tray with acrylic craft paint, and using Ranger Archive rubber stamp pad with waterproof ink and a stencil brush, I added a fantastic touch to a vintage cotton doily. 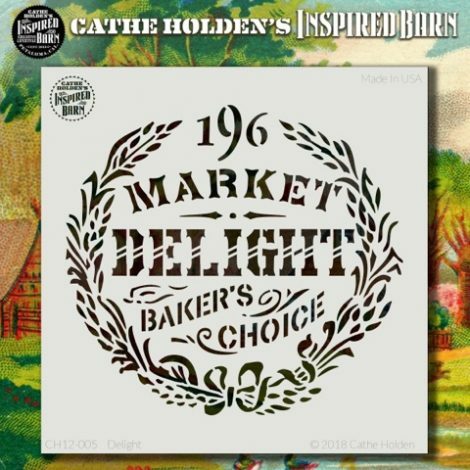 Because the stencils are flexible, they can be used on rounded surfaces. 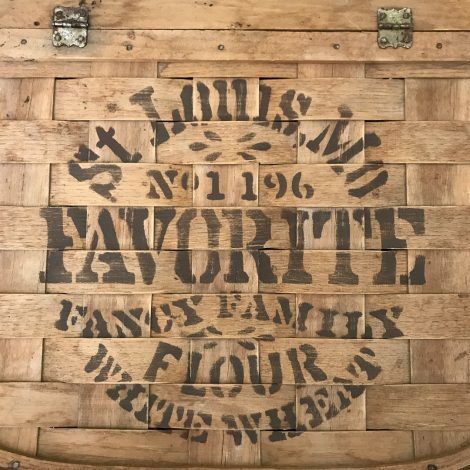 A super fun technique is using Sophisticated Finishes iron surfacer liquid like paint to stencil and once stencil is removed and the iron paint is dry, paint over the entire graphic with their rust antiquing solution. 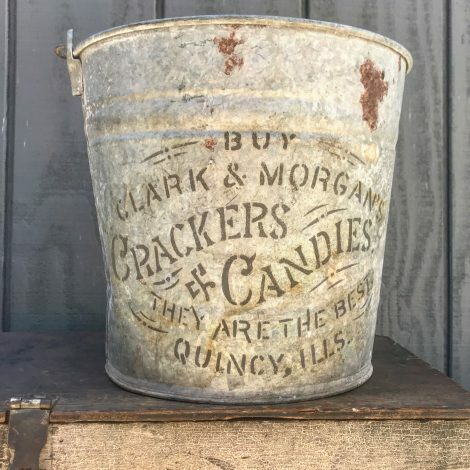 I think I could stencil galvanized buckets all day long. 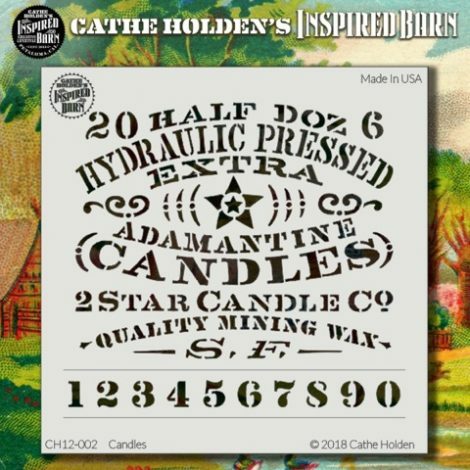 Here’s the CH-IB CANDLES stencil on a vintage pail. 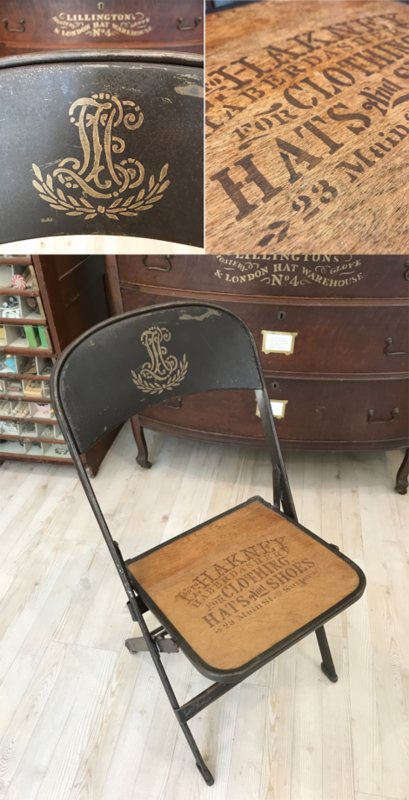 And the CH-IB LUCKY stencil on a vintage mop bucket. 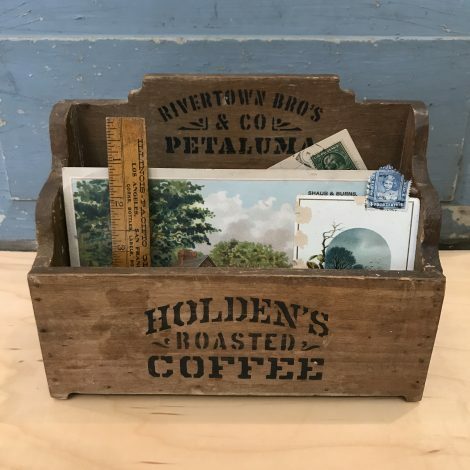 I found an old plant stand at the local landfill recycle area, perfect for displaying art at shows. 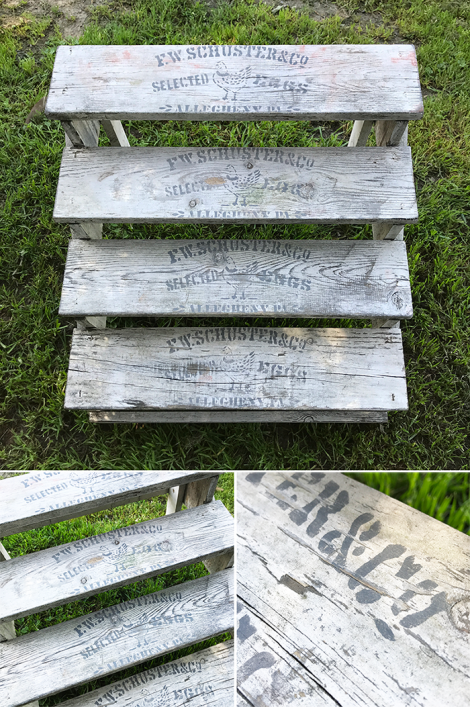 I stenciled each step to simulate boards from old egg crates using the CH-IB EGGS stencil, then lightly sanded to distress the paint for effect. 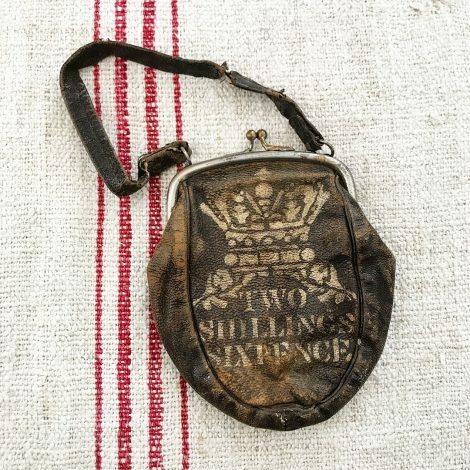 This sad, little leather pouch from last weekend’s local antique fair is now an awesome coin purse embellished with gold acrylic craft paint and just a portion of the 6″ version of the CH-IB SIXPENCE stencil. 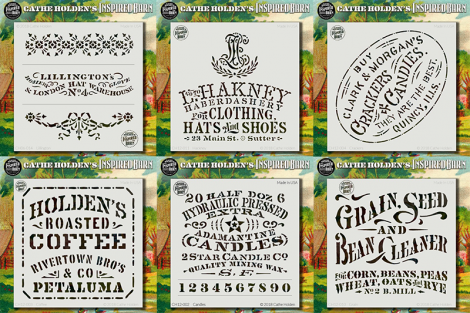 No blank surface is safe when Inspired Barn stencils are in the house. 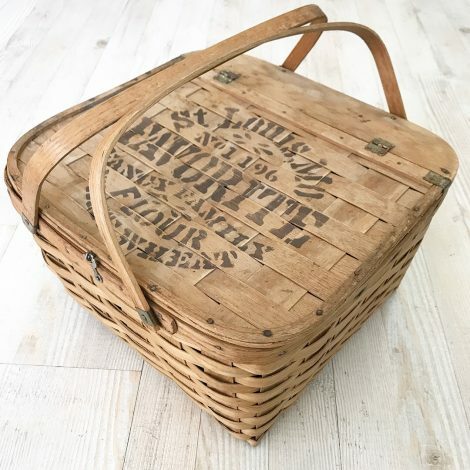 And I gladly take on the challenge of dimensional surfaces like this vintage pie carrier with a woven wood slat lid using brown acrylic craft paint and the CH-IB FAVORITE stencil. 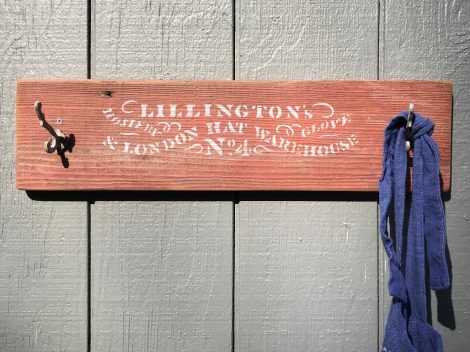 A spray-painted old metal tin has been turned into a tea bag holder for our kitchen with a mini 6-inch CH-IB FLOURISH stencil and acrylic craft paint. 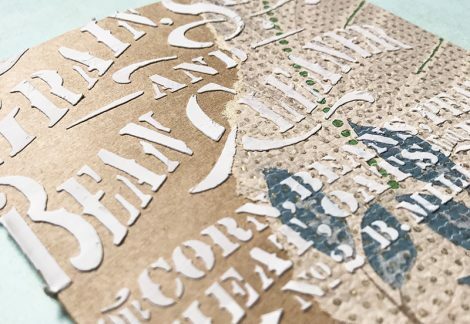 The larger, 12″ version was used with embossing ink and gold embossing powder on an old book cover for this mixed-media collage. 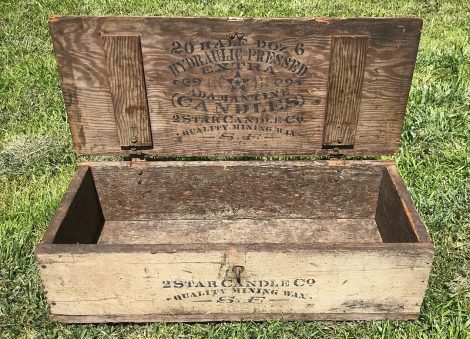 One of my new favorite places to shop is Facebook Marketplace for local goods. It’s becoming a serious competitor to Craigslist. This chair was FREE and only a mile or two away from me for pick-up. 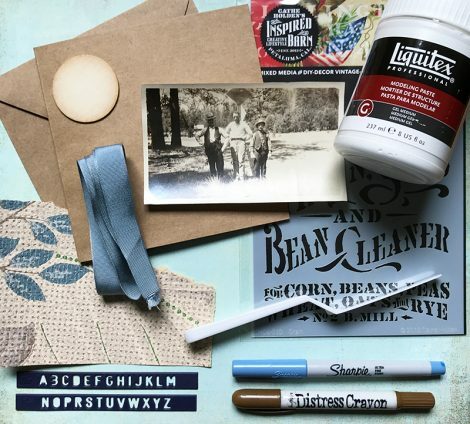 I uses white acrylic craft paint with the CH-IB DELIGHT stencil and in 5 minutes created a sweet farmhouse upcycle. This funky red box is given a real punch with white acrylic craft paint and the CH-IB SELWELL stencil. 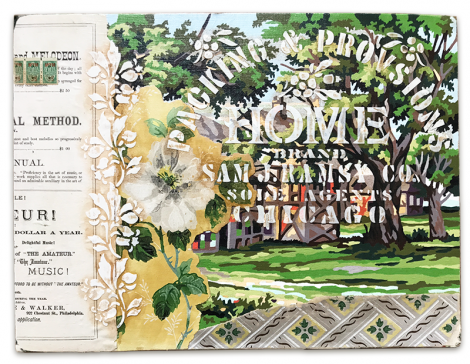 I used one of my least favorite paint-by-number paintings in my collection to create this mixed-media collage using texture paste, a distress crayon, and both the decorative and typographic parts of the CH-IB HOME stencil. 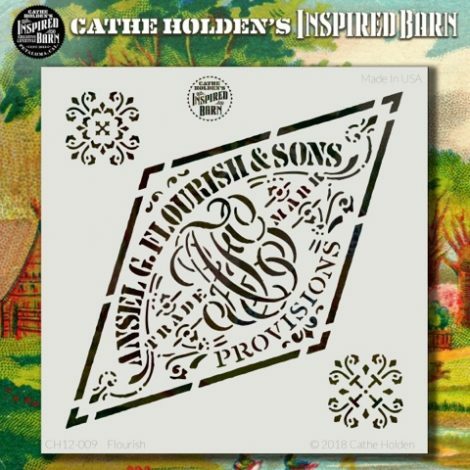 Speaking of paint-by-number paintings… here’s another updo with white acrylic craft paint and the CH-IB LUXURY stencil. 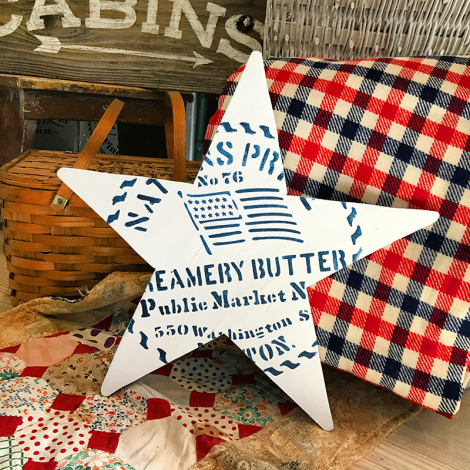 And finally, just in time for the Americana Art Fest and Vintage Market this month, a large wooden star is made additionally patriotic with navy blue acrylic craft paint and the CH-IB NATIONS stencil. 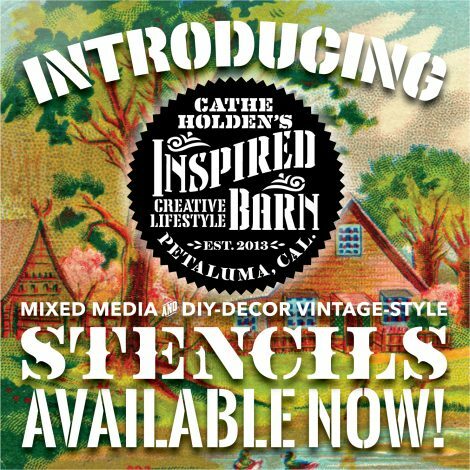 I can’t wait to see what YOU do with Inspired Barn stencils! 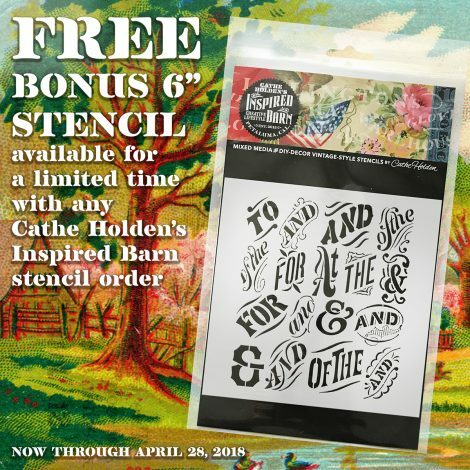 Shoot me an email and be sure to share on social media using hashtag #inspiredbarnstencils. 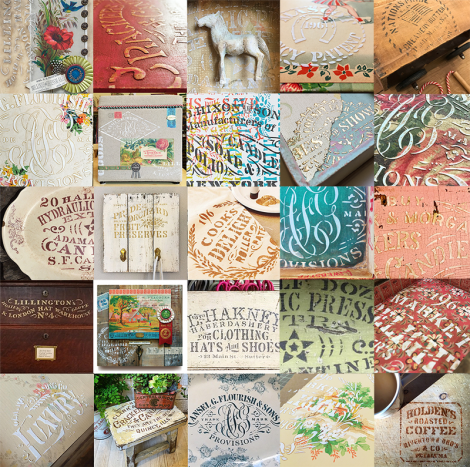 And please, share, share, share my stencils with your friends and followers, and pin, pin, pin! 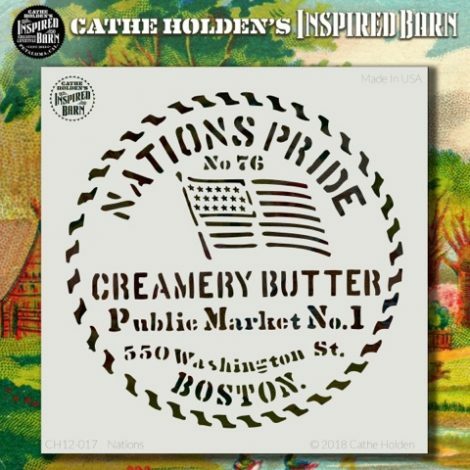 I am so excited to create my dream business with my husband and better serve this amazing creative community! 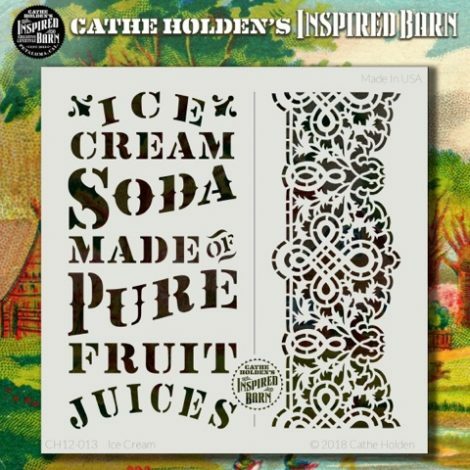 What’s next in the Cathe Holden Inspired Barn product line? 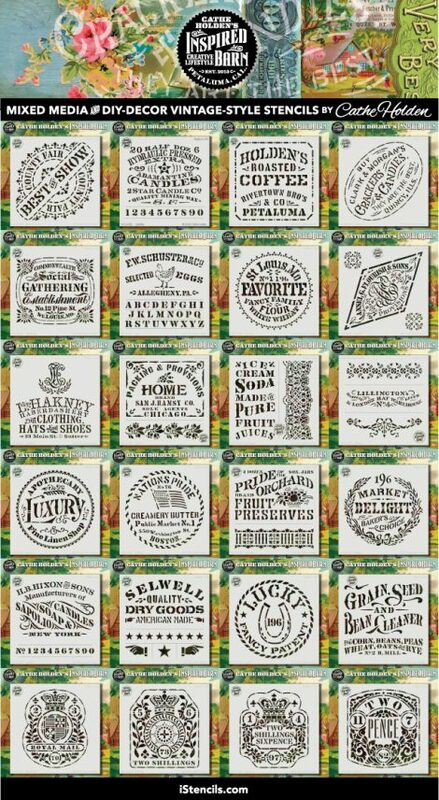 Acrylic stamps possibly! Let me know what you think! 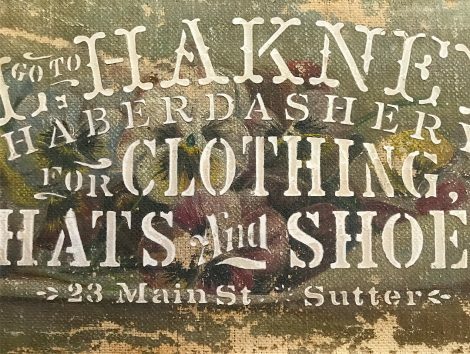 For years I’ve been creating my own typographic stencils inspired by early advertising flea market finds and different from anything I could find on the market. 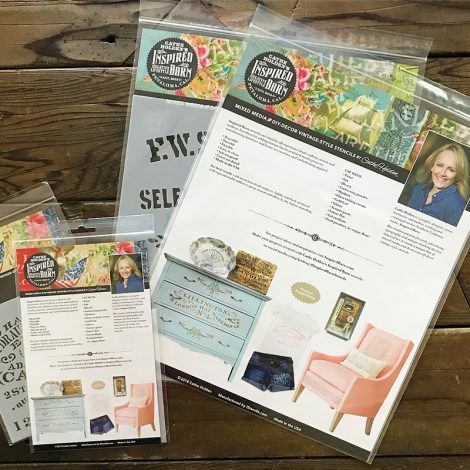 I cut my designs out with an electronic cutting machine to make stencils for use on everything from furniture and apparel to mixed media art and assemblage pieces. But not anymore!!! 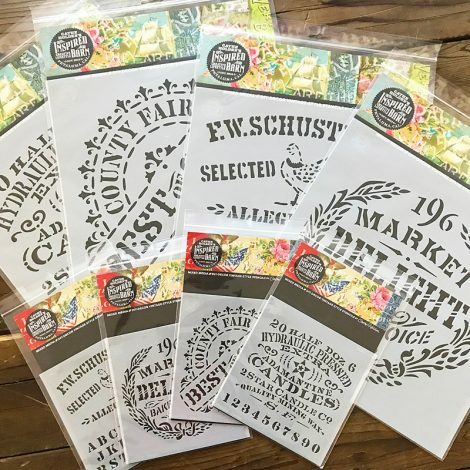 I’m thrilled to have partnered with iStencils.com to bring this exciting new line of typographic stencils to market and available to all- even international orders! 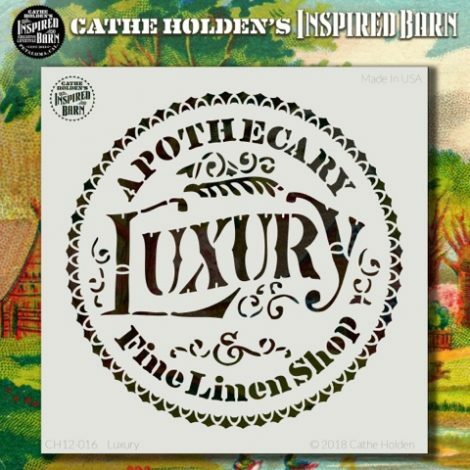 Cathe Holden’s Inspired Barn stencils are ideal for all experience level crafters, artists and makers. 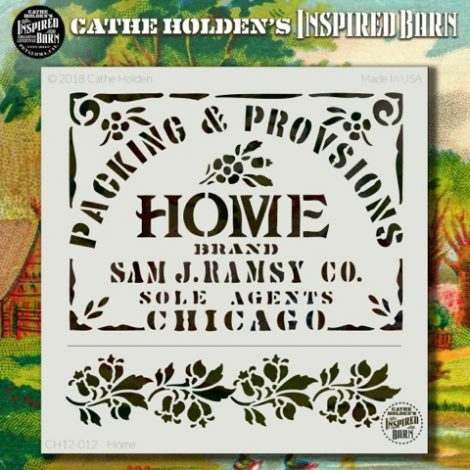 These stencils are excellent for adding texture layers in mixed media projects, transforming furniture and home accessories, and embellishing apparel. 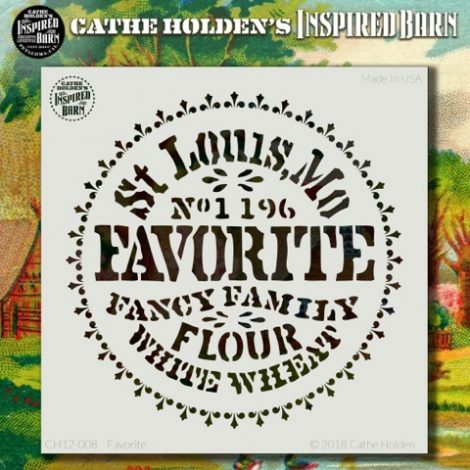 Use for cardmaking and collage, and even for food-crafting like dusting cakes and breads! 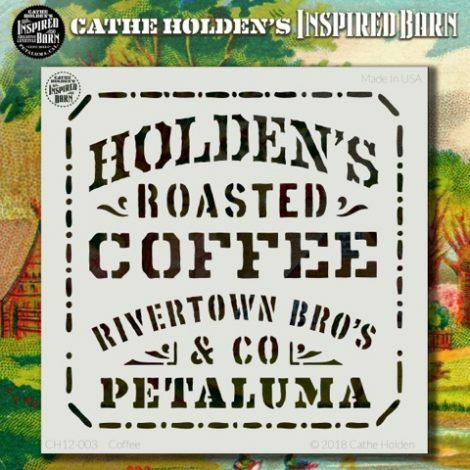 Each stencil is laser cut for precision from 7.5 mil mylar and individually packaged in a clear, zip-closure. 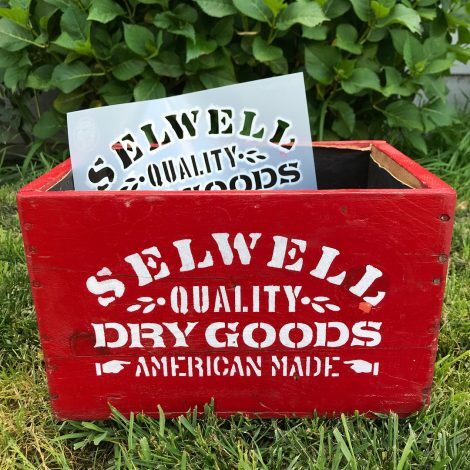 The stencils are reusable, durable, flexible, easy to clean, and solvent proof. 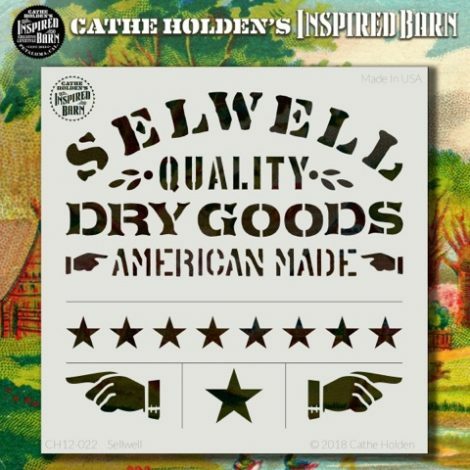 And, best of all, they are MADE IN THE USA! 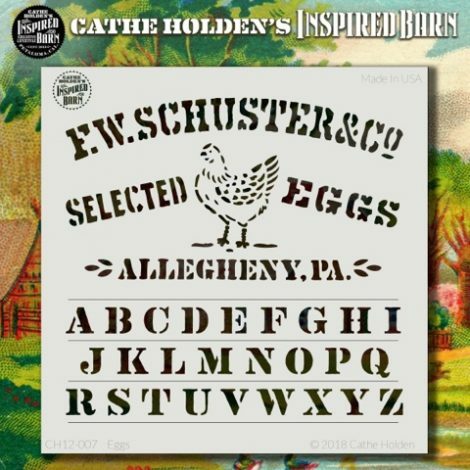 Order one or more stencils now through April 28, 2018 and receive this BONUS 6″ stencil FREE! 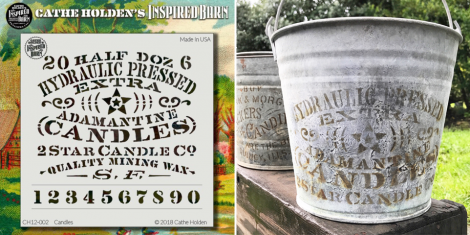 If you’re interested in becoming an Inspired Barn stencil STOCKIST, please contact Cheri McAllister at cheri@stencilsonline.com for wholesale ordering.